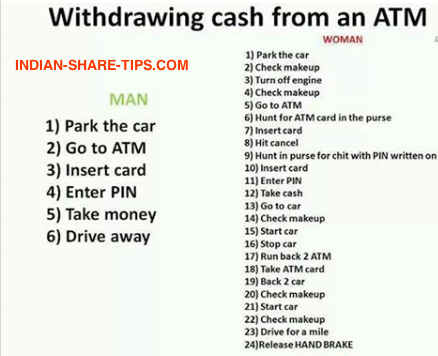 Why Women Take More Time to Draw Cash from ATM? In the outset we would like to let know our ladies that the below image is only in the lighter vein and is not to hurt any individual as aim is to reduce the stress generated during the market hours. The comments from the men and women folk are equally solicited. Do remember to subscribe for free stock market newsletter here.